I’ve chosen Burgmuller’s E minor “Inquietude” (Restlessness) from the composer’s Twenty-Five Progressive Pieces, to demonstrate a spring forward movement of the wrist used with groupings of three slurred 16th notes that permeate the selection. I also enlist syllables, “da-lee-dle” to assist with shaping the 3-note figures. The Schirmer edition is below. I use Palmer/Alfred which doesn’t have accented notes in the bass, just staccato entries. (Note that the Left Hand plays through the treble rests on the first and second beats) “da-lee-dle” refers to the three note right hand, slurred figures that occur between beats. Practicing should begin in slow motion. The Left hand triads are springboards into the three note 16th figures so the interdependency is evident. Chordal resolutions from Sub-dominant to Tonic, or from Dominant to Tonic suggest a shaping down. Think LEAN/resolve in these measures. In the video I demonstrate the need for a supple wrist that should move forward through the three note 16th groupings. It should start its motion from a lower position in order to move forward. (but not too low) If the wrist is too high, there’s no room to go forward. That’s why self analysis is an important component of practicing. In the G Major middle section, a G Major chord is followed by a G diminished chord, which suggests a slight leaning on the diminished and a relaxation to the G Major triad. After concerted slow practicing, a faster tempo should be approached GRADUALLY. Even up to tempo, wrist pliancy is always needed and the forward motion remains, though attenuated. Intertwined with the technical demands of this piece, is the requirement to play expressively in the Romantic genre. Next postTaking Piano Lessons: Skimming the surface or getting deeply involved? Your tutorial is very insightful.Like it very much. Seriously, Can you publish a study guide (DVD) on Burgmuller’s? His work is very popular among the students all over the world. Hi Li, Thanks for your kind comments. No, I haven’t thought about a Burgmuller DVD.. at least not as yet. 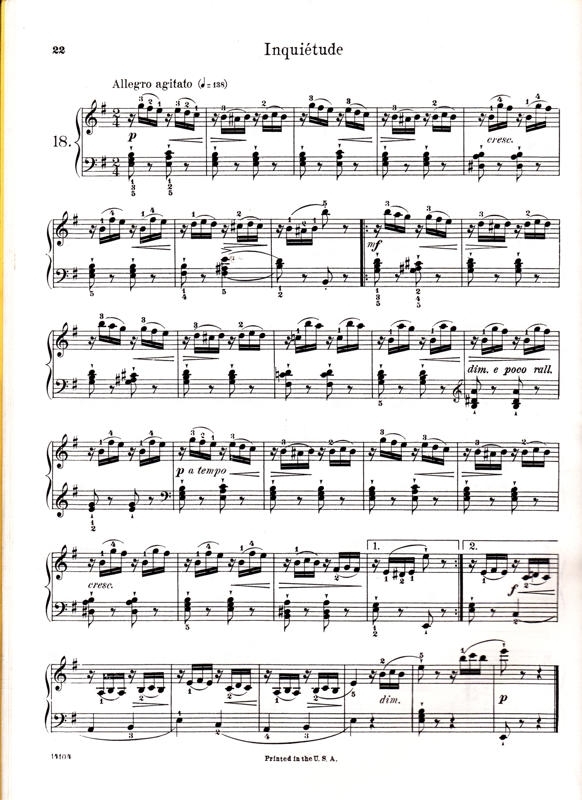 I remember performing OP.100 in total as the opener of a concert…something most pianists wouldn’t think to do,.